RCBC Fly to Singapore ~ Philippine Freebies, Promos, Contests and MORE! Enroll your RCBC Bankard in the e-Statement Via Email facility and enjoy the convenience of receiving your monthly statement on time, electronically. 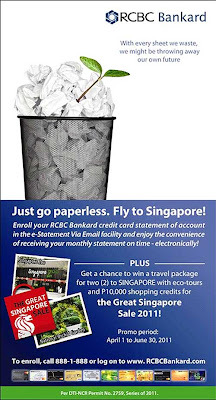 Plus, by going paperless, you have a chance to fly to Singapore. Earn two (2) raffle entries when you enroll and get an additional one (1) raffle entry for every online transaction/payment made within the promo period. This will be your ticket to win a travel package for two (2) to Singapore with eco-tours and P10,000 shopping credits for the Great Singapore Sale 2011 in the raffle draw. Hurry, enroll and get your raffle entries today!